Week long and Weekend Workshops featuring outstanding National and International Instructors. Come enjoy time to learn all new techniques and develop your arts-focused skills. Creating cloth with your hands is one of the most satisfying activities an artist can experience! In this workshop, students will receive an individual kit of colourful wool roving and miscellaneous yarn fibres that will be used to create an original piece of wet felted art cloth. The process is hands-on, fun and EASY! Everyone will go home with a starting point for creating hand made felt on their own, experimenting and growing their skills as they PLAY! 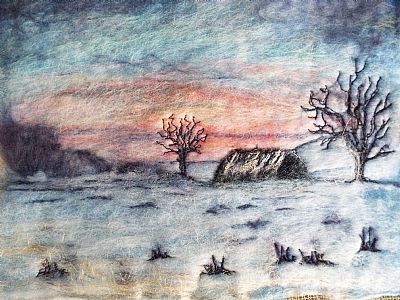 Handmade felted cloth can be used for various projects including scarves, vessels, wall art, table accessories, a base for embroidery and more. * Wet Felting Kit included. Bethany served as a member and Board Secretary for the Tett Centre for Creativity and Learning from 2015 to 2018. She is a Past Co-President of the Kingston Handloom Weavers and Spinners and is a member of the Kingston Fibre and Fabric Cooperative, the Ottawa Valley Weavers and Spinners Guild and the Ontario Handweavers and Spinners. She is a past president of the Canadian Quilters Association/ACC and was honored as the CQA/ACC Teacher of the Year in 2011. Bethany has recently served Studio Art Quilt Associates, an International Art Quilts organization with 3400 members worldwide and has served as their Central Canada Regional Representative. Beth was selected as Curator for the first major SAQA Exhibition coming to Canada, and she is active within the Surface Design Association. She also enjoys her active membership with both the Kingston Fibre Artists, Quinte Fibre Artists, and CONNECTIONS Fibre Artists groups in Ontario. She exhibits her work across Canada and the US, often in gallery settings and with group/Association exhibitions. Bethany travels and teaches for Quilt Guilds, shops, and women's groups by invitation. She is the Owner and Managing Co-ordinator for the FIBREWORKS KINGSTON Weekend Workshops Series which has brought the very best of the best Fibre Arts Educators to Canada since 1979. 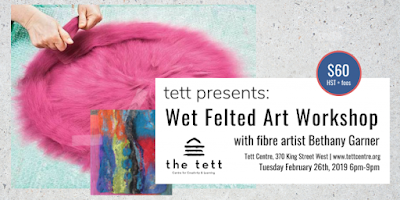 Show takes place at the Tett Centre for Learning and Creativity located at 370 King St West, Level 1. 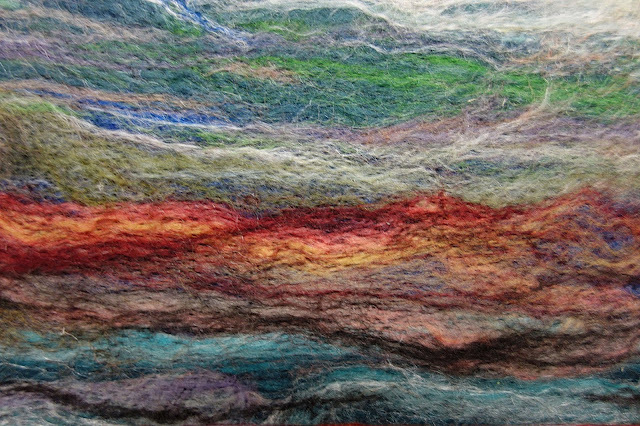 This is the 22nd annual exhibition for the group and features new work by 17 local artists, including a group challenge featuring fibre art using a favourite quotation as inspiration. Experience the exhibition with a tour and discussion with some of the artists. Watch some of the artists demonstrate their creative collage; using an air pen; chenille technique; modern embroidery; and using a knitting machine. Kingston Food Bank's Sandy Singers will open the show at the reception being held on Saturday April 13th from 2pm to 4pm. Food bank donations will be welcome at the reception and for the duration of the show. 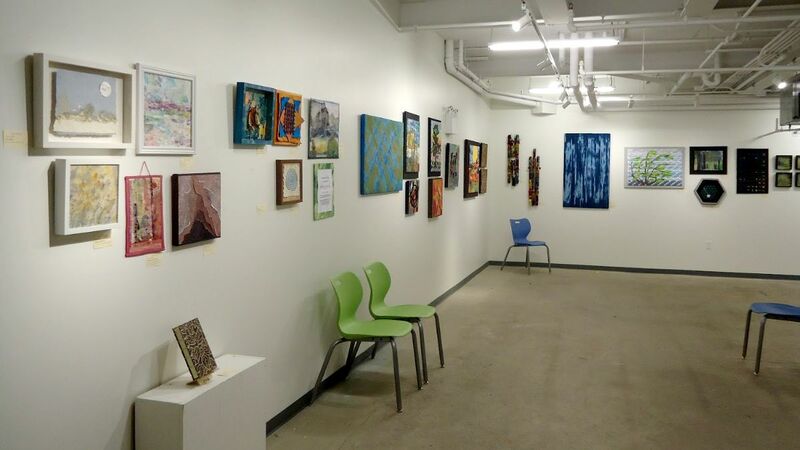 Art Threads is open Monday through Saturday from 10:00 am to 6:00 pm and Sunday from 10:00 am to 5:00 pm until the show is taken down Sunday, May 5th at 5:00 pm. 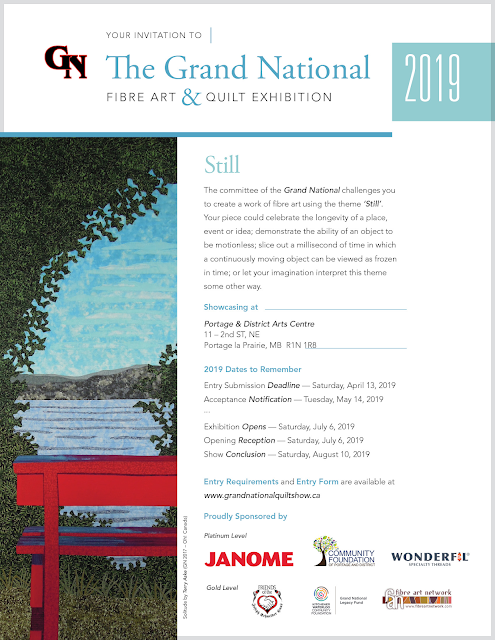 REMINDER: for all area quilt and fibre artists - Please join me in submitting YOUR entries to the 2019 GRAND NATIONAL Fibre Art and Quilt Exhibition "STILL" - the deadline is drawing near and this is an outstanding opportunity for our Canadian artists! The Grand National Committee and the Portage & District Arts Centre invite quilt and fibre artists from across Canada to participate in their 2019 thematic exhibition. The Grand National is “Still” an entity and the committee challenges you to create a piece using the theme “Still”. For example, your piece could celebrate the longevity of a place, event or idea; demonstrate the ability of an object to be motionless; slice out a millisecond of time in which a continuously moving object can be viewed as frozen in time or let your imagination interpret this theme some other way. 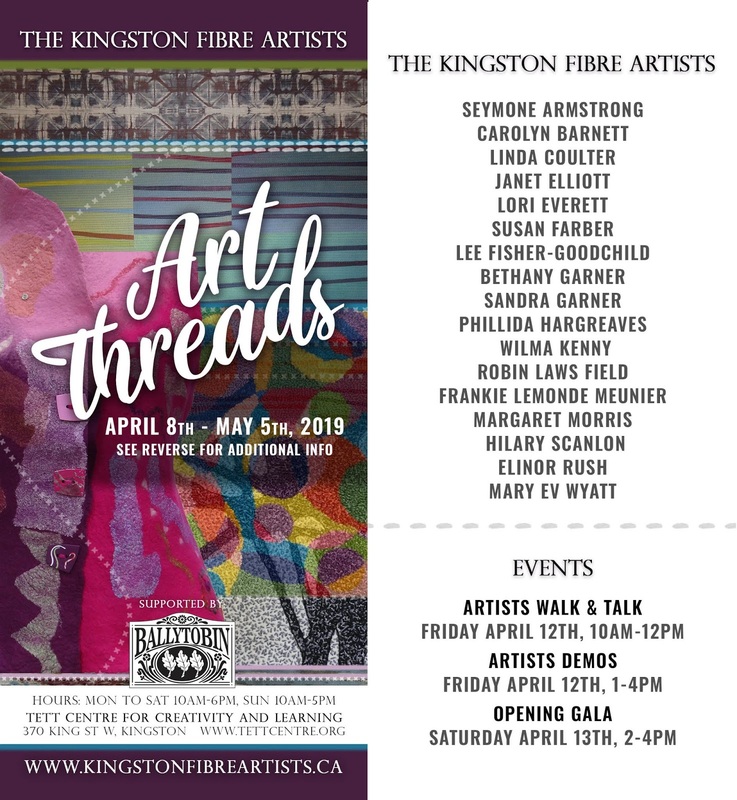 Kingston and Belleville Fibre Arts Professionals share their spring exhibitions with the Belleville and Kingston communities with their spring Shows. ! With an invitation from the Quinte Fibre Artists to join them in 2011, a truly wonderful group of friends has become a very important part of my arts filled life. I love being with all of these amazing artists - learning new skills, being inspired by their art and their dedication to the skills they have chosen to feature in their new work. 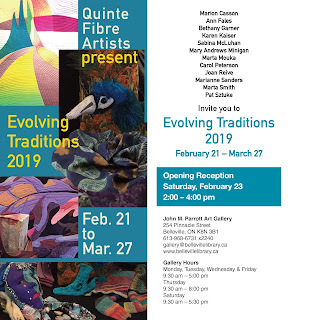 Please join us for the Opening Receptions or take a drive and enjoy the colours of spring as we mount all new work and share the joy of working with fibre and stitch! 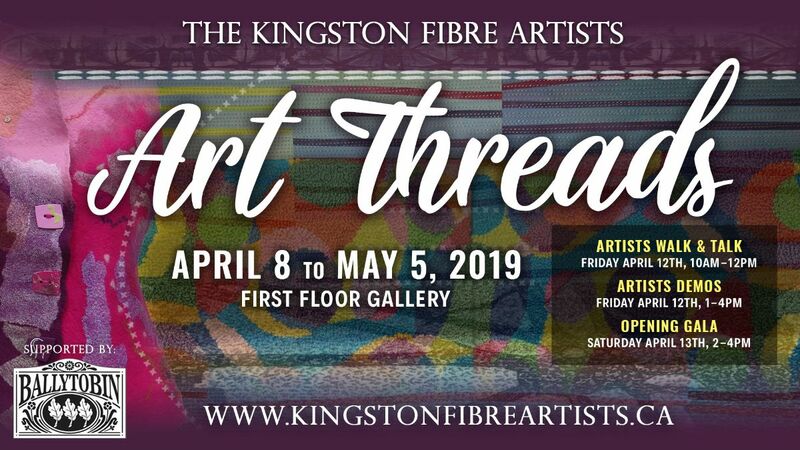 I have been a part of the Kingston Fibre Artists Collective since 1996 and have enjoyed so many wonderful opportunities to share space on gallery walls with the most amazing area fibre arts professionals. 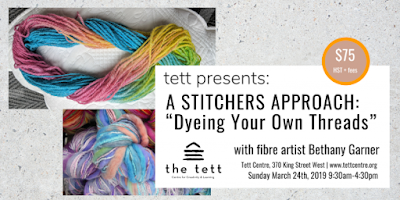 Seventeen amazing friends have brought together a collection of all new fibre art that will be featured for the April 8-May 5th period in the Community Gallery of the TETT Centre and welcome your visits. Teams of our artists will be present in the Gallery throughout the show to chat with visitors, walk through the exhibition and share some information about the various techniques used in the artwork. and help with the opportunity to arrange for artworks to be purchased. Friday, April 12th, we will share an "Artist's Walk and Talk" from 10 am to 12 pm. Later that afternoon, a group of four talented artists will share some of their favourite skills during a demonstration scheduled from 1-4 pm. Please plan to join us for either or both events. When a class is cancelled, that leaves time for creating art - so off I go. Heading into my usual piecing frenzy for two great upcoming shows!!! AND I have a great stash for the scheduled WET FELTED ART workshop … have a peek and see if your calendar will allow you a chance to come and play along! We will be creating landscapes that can be mounted and shared on canvas or framed and set inside a frame. LOVE small art landscapes in felt!! 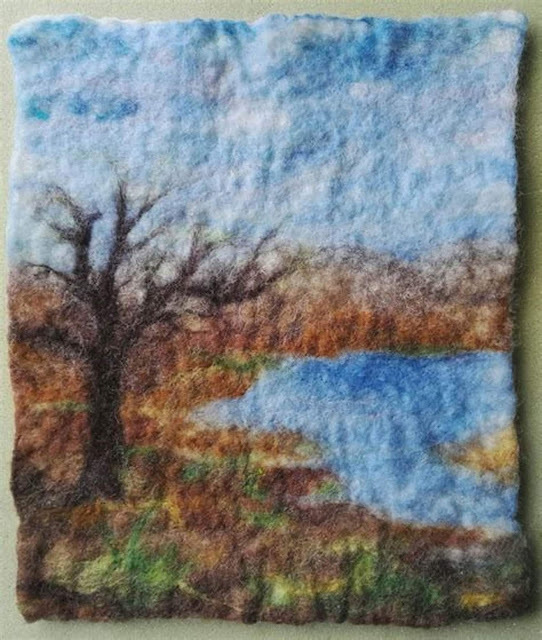 Making small landscapes is sooo much fun... and I supply all the wool for the class. Come join me and have some fun! Layering, wetting, rubbing, layering again - so easy and you can take new skills in any direction you want! When the calendar has openings, that means I can get busy and make ART! The cancelled class at the start of February means I have time for creative play time at my house! I LOVE that! The QUINTE FIBRE ARTISTS show is coming fast now, with art work delivery due in Belleville February 16th. I hope you will mark your calendar and join us for a visit - this is a grouping of artwork by very talented artists from Picton, Belleville, Tweed and Wellington. (and yes, I am honored to be included as the Kingston area member - so much fun to work with these wonderful women! Then comes the KINGSTON FIBRE ARTISTS Show and Sale "ART THREADS" Opening April 8th at the Tett... lots of stitching on the machine and by hand. Loving working with WOOL this winter... what a perfect choice on these cold wet days. Enjoy these winter days for your own special stitch time... can't wait to see what you have been up to! Hand Dyed Rovings and Wet Felting classes coming during February at the Tett Centre for Creativity and Learning - Come play!! 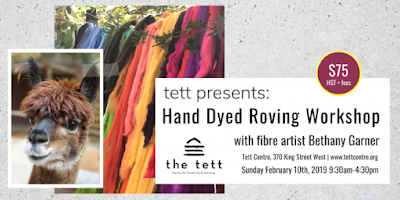 I will be providing the sample wool for the dyeing of the roving in the classroom (included in the fee for the class) and you may bring additional wool or alpaca roving for dye work at this 6 hour workshop in the Activity Room at the TETT. 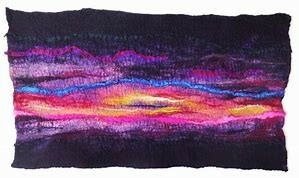 Do look at your calendar and see if Sunday February 10th is open and would allow you the fun of creating a beautiful palette of fibre for your arts projects,,, spinning, weaving and fibre arts. Hope you will come along and bring a friend! Learn the basics of creating your own felt for hand made projects including scarves, vessels, base fo embroider and other forms of art... Love to have newbies in class to share in the fun of this creative process... Kits are included in the price - so all you have to do is come and play! I LOVED working with a terrific group of fifteen arts students at the TETT Centre this past Thursday evening - and we had the best results ever in a MARBLING CLASS - such great enthusiasm and true arts savvy displayed in the trays of carrageenan as the artists (some who have never created ANY artwork) worked their way through prints on the surface of thickened seaweed and applied the DHARMA TRADING Marbling Paints... Awesome! TETT CENTRE offering Professional Practices Series in the New Year - is this for YOU??? Hoping that you are enjoying quiet days and creative bursts of energy now that the Holidays have passed and the peace of being home and in the studio is bringing you joy! There is much going on in the Kingston Community and the listings of workshops at the TETT Centre is growing weekly. I am sharing several workshops and am excited to have time with all of the students who come through the TETT Centre doors to learn new techniques and playful pass time activities that will follow them through their lives. There are so many wonderful things going on inside the doors at the TETT, and you are most welcome to join in for all the fun! 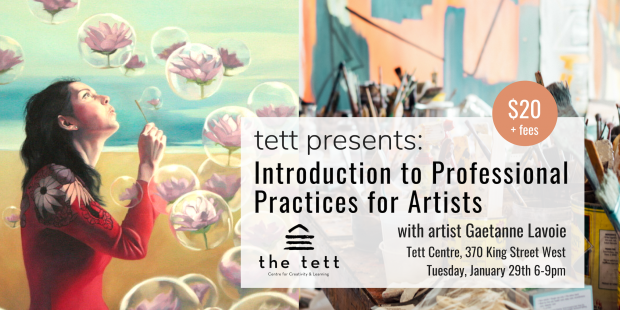 I personally am interested in attending the Professional Practice Series of workshops that will be delivered by painter/artist Gaetanne Lavoie at the Tett Centre for Creativity and Learning. Gaetanne will share an Introduction to Professional Practices session on January 29th..
On the 29th of January, arts-focused attendees will enjoy a comprehensive 3-hour workshop that will cover the basic necessities to begin your journey toward becoming a self-sufficient professional full-time artist! Become your own boss and begin to dictate how the market receives your work. Rather than the market dictating what you create, create what you want and learn how to market, sell and finance your art. 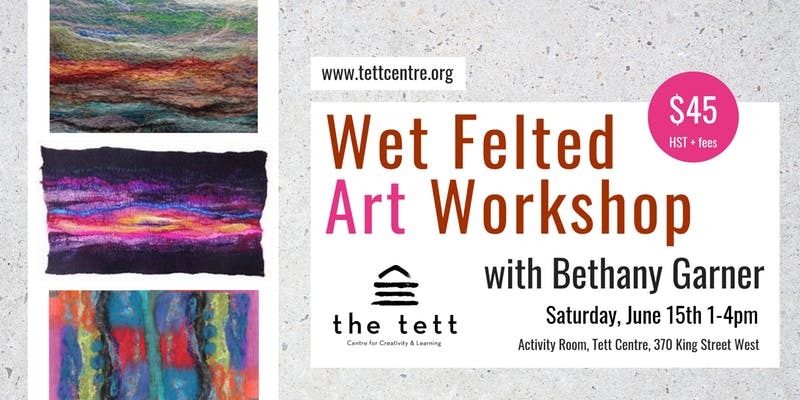 Here is a link to the TETT Events Calendar and the workshops listed below: (scroll through for workshops and events that are of interest to you. Links available on the website for detailed information. HAND DYED ROVINGS, February 10th, Full Day Workshop, 9:30-4:30 pm - plan to have some good fun! A QUILTERS APPROACH, DYEING YOUR OWN THREADS, Sunday, March 24th - Cotton and Tencel/Rayon/Wool threads will be dyed in class using the basics of PROCION MY Dyes with a touch of Acid Dye play. 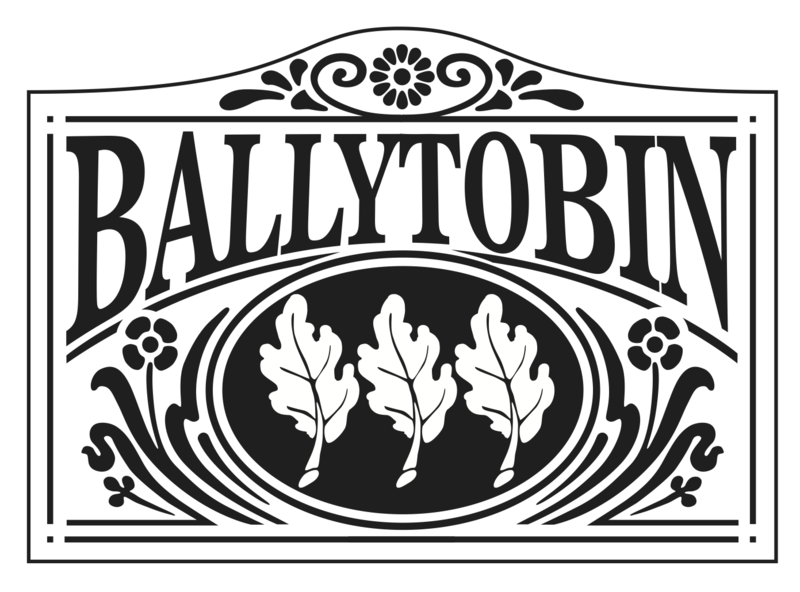 Full day class, 9:30-4:30 pm. Threads supplied for samples and you are welcome to bring your own! Hope to see you at the TETT in 2019! All photos and written material are the property of the original artist.. Awesome Inc. theme. Powered by Blogger.